IMBB 12: is my blog taboo? 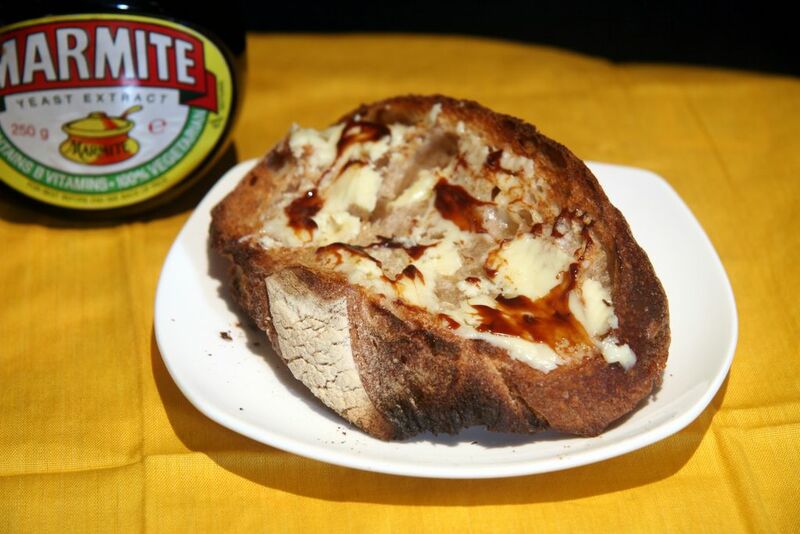 One of my favourite snacks in the whole world is a nice piece of toast and some delicious, fresh butter (European-style, of course,) topped with a thin spread of Marmite. Marmite leaves you little room for a middle ground - you either love it or you hate it. Magnified Marmite, yum, Click to Enlarge. Apart from the fact that it tastes so marMighty fine, Marmite has one of the cleverest advertising campaigns I have ever seen. They completely play off of the fact that half of Britain despises the stuff as ferverently as the remainder adore it. Check out their totally brilliant website which is as much fun for the haters as it is for the lovers. Yes, the Marmite haters get their own separate hellish web pages, complete with suggestions for sandwiches equally as horrific as those made with Marmite, including a Musty offal stew with emmental cheese and a Battered bogey bap. This morning, shortly before Fred arose, I enjoyed a nice cup of tea and a slice of toast and Marmite for my breakfast. About ten minutes later he surfaced and came down the stairs. He greeted me with a kiss on the lips. At once his nose started twitching and he started sniffing. "Bleh", he muttered, "You've been eating that stuff again". I asked him if he'd like me to make him some. "No! C'mon... I hate that stuff. You know. You still ask me why? Because it's awful. Euuwyeuch!" So, I failed. I tried twice, today, to persuade Fred to try some Marmite. Combined with all the other times I've tried to trick him into trying the stuff since we met nearly two years ago, I don't think it's ever going to happen. -I used to be a Marmite Baby. -My desk at work is decorated with all the empty marmite jars I have amassed whilst living in the US (over 4 years). -I got my eloquent description of Marmite published last year in a a BBC news report about English icons. "Ex-pat Sam Breach, living in San Francisco, nominated Marmite and said: "Apart from all the ex-pats scattered around the world who hoard stockpiles of this delicious, dark, gloopy, salty spread in their foreign kitchens, this uniquely-shaped, yellow-lidded little jar full of savoury goodness is something only the English truly take to their hearts." -Marmite should be spread very thinly. No wonder the French don't like it, if they think it's meant to be spread like Nutella. -I once worked in Sweden for a while. I made a large plate of Marmite sandwiches for all my office mates there. They all absolutely LOVED Marmite. There wasn't one sandwich left. Ever since, I have always loved the Swedes. What a discerning bunch of people and what great taste they have! -One of my favourite TV Ads of all time featured a first-date kiss that ended in disaster because one of the couple had eaten some Marmite shortly before the very brief snog. Love it! 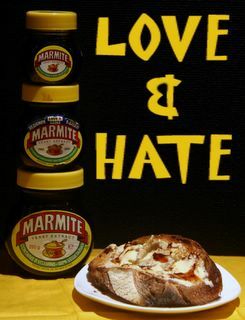 Well, I love your entry but I don't love Marmite so much...because I'm a Vegemite girl! Marmite to us Aussies is a bit too sweet, if you can believe it! I actually wrote about Vegemite Risotto in my entry. It's funny, of the 3 entries I've seen so far for this IMBB, all have invovled Marmite or Vegemite! 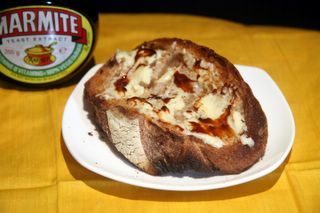 Alberto at Il Forno needs a lesson in proper quantities of Marmite to butter, though. No wonder he hated it; he spread it like jam! Eeeughh!! Well, you know i don't like vegemite cos it's so brown and hard, whilst marmite is darker and glossy and gloopy. I am off to check out Alberto now. That's the trouble - the spreading technique is so important. A whisker too much and you've blown it! well, i've never had marmite, but i love everything british and go to london as often as i can, so i'm sure i'd be a fan. however, my friend jason, well, my favorite bartender who in turn says i'm his favorite barista, often comes at seven a.m. to have his coffee or tea and toast, but brings his own marmite. funny, he's so generous in every way, shares everything and always gives me a deal on my drinks, but NEVER ONCE has offered me a bit of marmite. i'll have to look into that, selfish bugger. Yeah, Vegemite does rather resemble road tar, doesn't it? Did you know that, because Australia's beer consumption has fallen, Kraft is having more trouble sourcing the leftover brewers years that it requires to make Vegemite? Hard to believe when you think about Australia, isn't it? ewwwwwhh. I really tried to like "marmite on toast" when I was on holiday in AUS. But I couldn't do it. I have some Aussie pals who think peanut butter is equally unfit to eat! Oh, I'm not English enough... the massive close up looks delicious though! While Sam and I have many different tastes, I loved fruit cake, she loved sponge, she loved bananas, yuk, even more yuk with cream, especially clotted cream (about the only thing I can't stand from Cornwall!) The one thing I agree on is Marmite. I love it. I've yet to meet an Irish person who likes it and very rarely one who has tried it, this is reflected in the fact that you can only buy it in the small jars for large amounts of money just over the sea from the UK. I still have to stock up on jars when I'm in the UK. Of my 3 children who were all Marmite babies, Dillon can't stand it now, Mollie loves it and when she has it on toast it is the only time she'll eat butter, Ben's easy come easy go, he'll eat it but prefers marmalade (like his Daddy). As for me I love it on well done toast but my favorute would be slices of fresh white farmhouse filled with butter, marmite, cheddar cheese and salt and vinegar crisps, ahhh heaven. Mmm, Marmite. Love it. Vegemite too (I get the best of both British & Antipodean tastes!). My favorite recipe after 'thinly spread on toast' is 'thinly spread on white bread with a layer of potato crisps'. For school lunch in Australia my mother made our sandwiches spread with vegemite and added chopped walnuts on wholemeal bread. A great combination. I'm a latecomer to your blog but would like to say what an excellent blog it is! Growing up, our family used to use Maggi seasoning sauce on everything (it's very common in SE Asian households)and my mother and I used to eat it on bread with butter. It wasn't until a roommate introduced me to Marmite that I realized Maggi is essentially liquid Marmite. Go figure. ::laughing:: I was hoping to say this in more privacy but I couldn't find email for you! ::covers mouth to muffle sound so no one else will here:: Sorry for blowing the beer thing, sprouts are my daughter's fav veggie, I make 'em every Thanksgiving and Christmas even though I know she won't be here. ABOUT being Vegan, are you still vegan? Did you look into the possibility of nut proteins? We where on a modified eating schedule (alternated weeks of vegan, vegetarian, meat). We did this for a couple years. The main purpose was Mike's cholesterol situation. HORRIBLE! Some of the great side effects were that he lost about 20lbs right off the bat and that we created a more balanced diet. We don't adhere so rigidly but vegan and vegetarian meals are commonplace. This is a very late comment. I got here from your photo don'ts post and had to add my adoration. Marmite on toast with tea, MMMMM. And, since it's already lunch time and I haven't eaten yet, I guess that's going to be my lunch, with some nice, creamy scrambled eggs. Love it. I grew up in wartime England but have lived the last 39 years in Australia. Occasionally parents would bring Marmite when they visited - Yeaay! Now my 2 girls live in London, and after 12 years one of them sent me one Kg of Marmite - yeaay! The Aussie version made by Sanitarium is not the same as the British version, different formula I think. Vegemite has a stronger yeast flavour - that is why they use so much salt - to cover its taste! I lived for 7 years in SE Asia and found Marmite in the small shops and jungle towns there. There, they use it for flavouring plain boiled rice! If any Aussies in UK or SE Asia can get me Marmite, I'd gladly swap it for TimTams! OMG! I love Marmite / Vegemite! I grew up in Nor-Cali but my friends across the road's parens were from Scotland & Australia - the best sandwich ever is cracked wheat w/butter, marmite/vegemite & a bit of cheddar & tomato broiled open-faced...Yum! I live in Berkeley. Does anyone know where I can find Marmite in the East Bay? I'll settle for Vegemite (or as call it, "Marmite Lite"). Hi Jason - I am not 100% certain - but I think you may even be able to get it in some Safeways? Please where can I find Vegimite in San Diego!!!! ANYONE!!! Marmite on fresh white bread and lettuce brings back memories from school as well as Marmite and chicken chippie sandwiches yummo!! You can get Marmite, Vegemite and Bovril at Shakespeares Corner Shoppe in Mission Hills on India Street, there tel no. is 619 683 2748. Hope this helps.